Kathleen McGrath is a nutrition educator based in Atlanta, Ga. She began writing in 1995 in a corporate setting and currently writes for various websites. She earned a Master of Science in nutrition education from Georgia State University. Containing vegetables packed with fiber, vitamins and antioxidants, soup can be a healthy meal choice. Canned soup is convenient, but usually at the cost of high sodium, high fat content and artificial additives and preservatives. Many food manufacturers offer healthier choices such as low-fat and low-sodium soups, and organic, additive-free soups. Amy’s Kitchen Lentil Vegetable Soup Light in Sodium is one of the healthiest canned soups available because it is organic, free of artificial additives and MSG, and lowest in sodium, at 290 mg per serving. It provides more nutrients than other soups, including 7 g of protein, 8 g of fiber, 45 percent RDA of vitamin A and 20 percent RDA of vitamin C.
Amy’s Kitchen offers other healthy choices, including Lentil Soup Light in Sodium. One serving provides 6 g of fiber and 8 g of protein with 5 g of fat -- 4 g of which are unsaturated -- and 290 mg of sodium. Another healthy choice is Amy's Split Pea Soup Light in Sodium, which is fat free and has 6 g of fiber, 7 g of protein and 15 percent RDA of vitamin A. Healthy Choice Traditional Lentil Soup is a nutritious choice, but contains 440 mg of sodium, which is higher than the other soups. Other healthy soup options include Wolfgang Puck Soups and Health Valley Organic Soups. 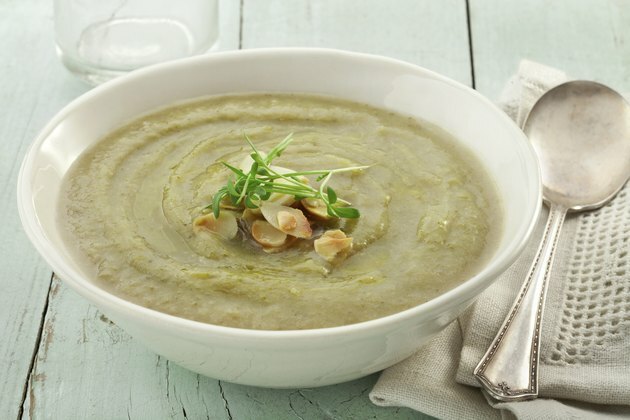 Wolfgang Puck Soups are organic, all-natural and preservative-free, and contain no MSG. Health Valley Organic's low-fat soups are high in fiber and antioxidants. Health Valley also offers 40 percent lower sodium and no-salt-added versions. The American Heart Association certifies foods that meet heart-healthy requirements. The requirements per serving include less than 3 g of fat and 1 g of saturated fat -- or 5 g of fat and 2 g of saturated fat for meat products -- less than 480 mg of sodium and at least 10 percent or more of vitamins A and C, calcium, protein and fiber. Healthy soup choices certified by the American Heart Association include 25 Campbell’s Healthy Request soups and Healthy Choice brand soups.